Hemolytic-uremic syndrome (HUS) is characterized by hemolytic anemia, thrombocytopenia, and renal failure caused by platelet thrombi in the microcirculation of the kidney and other organs. Typical (acquired) HUS is triggered by infectious agents such as strains of E. coli (Stx-E. coli) that produce powerful Shiga-like exotoxins, whereas atypical HUS ( aHUS ) can be genetic, acquired, or idiopathic (of unknown cause). Onset of atypical HUS ranges from prenatal to adulthood. Individuals with genetic atypical HUS frequently experience relapse even after complete recovery following the presenting episode. Relapsing HUS is more likely to be genetic. In most cases it is caused by chronic, uncontrolled activation of the complement system , a branch of the body’s immune system that destroys and removes foreign particles.Sixty percent of genetic aHUS progresses to end-stage renal disease (ESRD). The final outcome of aHUS is usually death or permanent renal or neurologic impairment. Disease-causing mutation (s) are identified in one of the ten genes known to be associated with aHUS, irrespective of familial history. Genetic atypical HUS can be multiplex (i.e., familial; two or more affected family members) or simplex (i.e., a single occurrence in a family). - Atypical HUS is considered acquired when an underlying environmental factor such as drugs, systemic disease, viral agents, or bacterial agents that do not result in Shiga-like exotoxins (Stx) can be identified. - Atypical HUS is considered idiopathic when no trigger (genetic or environmental) is evident. Both children and young adults with aHUS have* nonspecific symptoms* of illness: pallor, poor feeding, vomiting, fatigue, and drowsiness. Anuria or oligoanuria with or without peripheral edema may be present. Marked hypertension may also be present either from the acute kidney injury or from the ischemia caused by the TMAs . Hypertension may be severe enough to provoke posterior reversible encephalopathy or cardiac failure. Half of children and the majority of adults need dialysis at admission. Extrarenal manifestations are observed in 20% of patients. The most frequent extra renal manifestation is CNS involvement (10% of patients) with diverse presentations: irritability, drowsiness, seizures, diplopia, cortical blindness, hemiparesis or hemiplegia, stupor, and coma. Myocardial infarction due to cardiac microangiopathy has been reported in approximately 3% of patients and is presumed to be the cause of reported episodes of sudden death. Five percent of patients present with a life-threatening multiorgan failure due to diffuse TMA. Less commonly, aHUS patients have more of an insidious onset, with subclinical anemia and fluctuating thrombocytopenia for weeks or months and apparent normal renal function at diagnosis. Unusual presentations of aHUS are possible. Some patients have little or no anemia or thrombocytopenia and the only manifestation of an active TMA is hypertension and proteinuria with or without an overtly abnormal creatinine. of complement regulators, including CFH, CFI, CFB, anti-CFH antibodies and MCP expression on leucocytes. Various defense mechanisms exist in humans to protect from invading pathogens and the complement system is a key element of innate immunity that aids in rapid recognition and elimination of pathogens. The complement system consists of more than 30 different proteins, most of which are synthesized in the liver and distributed across plasma and cell surfaces. The complement system has three primary functions; cellular lysis by opsonization, generation of inflammatory mediators and modulation of adaptive immune response. Activation of the complement system is crucial and occurs by three different pathways and all of them converge at the formation of C3 convertase. 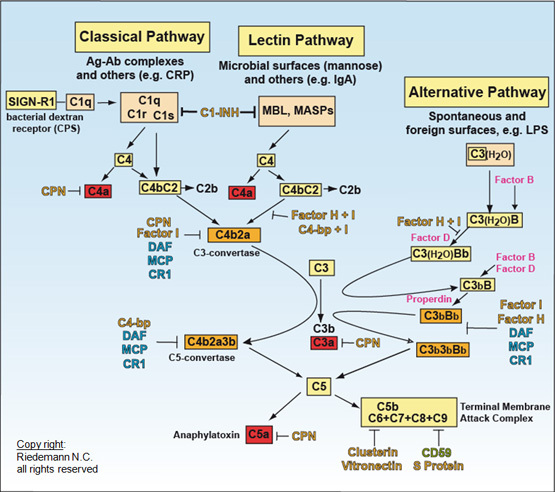 The alternate complement pathway (AP) is constitutively active and functions as an arm of our innate immune system. Tight control of the AP is required to limit unregulated generation of C3 convertase and subsequent generation of the C5 convertase. C5 convertase activity leads to cleavage of C5 and liberation of C5a, an anaphylatoxin. The sequential assembly of C5b and C6-C9 to form the membrane attack complex5 at the vascular endothelial cell surface causes endothelial cell damage, platelet activation, and thrombus formation. The first indication that excessive activation of the AP was associated with aHUS came in 1973 with the report of 5 patients with HUS and low plasma C3 levels. Since that time, several dysregulated complement pathway proteins have been identified in patients with aHUS, both with and without decreased C3 levels, and it is now known that a decreased C3 is not universal in aHUS. It has been shown previously that mutations in genes encoding proteins that regulate the AP or autoantibodies that inhibit complement regulatory proteins can be identified in approximately 60%-70% of aHUS patients. Both mutations that result in a quantitative deficiency of protein and mutations associated with a normal plasma level of functionally ineffective protein have been identified. Therefore, measurement of complement factor levels cannot substitute for mutation screening in patients suspected of aHUS. generally contraindicated as they worsen the thrombotic microangiopathy and anemia. Plasma exchange therapy is the first-line therapy for children with aHUS and should be initiated as soon as the diagnosis is suspected. Although plasma infusion replenishes deficient complement regulators, plasma exchange has the added benefit of removing mutant complement factors and/or autoantibodies. The rate of remission after plasma exchange is variable (30–80%) depending on the genetic mutations. Plasma exchange is of little benefit in patients with a MCP mutation as MCP is not a circulating factor. The duration, dose and frequency of plasma exchange should be adjusted on a case-by-case basis. Immunosuppressive agents are of no benefit in aHUS except in patients with complement factor H autoantibodies, in whom they can be used in conjunction with plasma exchange . In the future, concentrated complement factor H (purified/ recombinant) when available could be used to replenish deficient or mutated complement factor H.
The generation of terminal complement complex is quintessential for the pathogenesis of aHUS. Eculizumab is a monoclonal antibody to C5 that prevents cleavage of C5 to C5b, preventing the formation of terminal complement complex. Recently, eculizumab has been used in patients with aHUS with good results. There is an increased risk of developing Neisseria meningitis infection with the use of eculizumab and patients need to be vaccinated prior to initiation of therapy with eculizumab.